Ukrainian Foreign Minister Pavlo Klimkin has denounced the damage done by unidentified vandals to two memorials to the Poles who perished in the 1940s in the Lviv region. 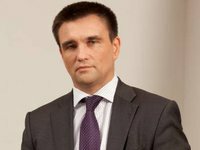 "I condemn another acts of vandalism against Polish monuments in the Lviv region," Klimkin posted on his Twitter account on Sunday. Furthermore, he said that both acts of vandalism have "a well-known hand of the third party, to which we are jointly giving a resolute rebuff." Unidentified attackers have vandalized two memorials to perished Poles in the Lviv region over the past few days, the Ukrainian National Police main directorate's communications department in the Lviv region told Interfax earlier on Sunday. Unidentified assailants have poured red paint on the monument to the Lviv Polytechnic National University professors, who have been executed by the Nazi troops in the summer of 1941, and have written an insulting inscription on the monument on March 10, the police said. The similar incident has occurred in the populated locality of Pidkamin, Brody district, a day later, when red paint was poured on the tomb monuments to the Poles, who perished in March 1944. "The investigators have classified offenders' actions as hooliganism [...] The law enforcement agencies are undertaking measures to establish wrongdoers implicated in the perpetration of misdemeanors. Investigative actions are underway," the Lviv regional police communications department said in a statement. The main regional police department recalled that the penalty under part 1 Article 296 (hooliganism) of the Ukrainian Penal Code is a fine from 500 to 1,000 non-taxed minimum incomes of citizens or an arrest for the term of up to six months, or limitation of freedom of up to five years. "Both monuments have already been cleared; no damage has been discovered on them," it also said.